This website presents a project that involves both computer vision and artificial intelligence to give a computer the ability to emulate a human playing a computer game. The computer vision component deals with recognizing objects and the area of play in a game, taking input in the form of images displayed on a monitor. The artificial intelligence (AI) component reacts to events based on the output of the computer vision component. The project has two phases with the goal of achieving at least Phase I and, with time permitting, implementing Phase II. 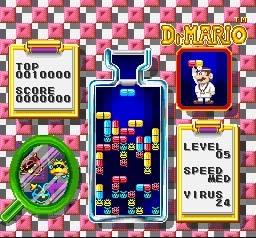 In either case, the game used is restricted to Dr. Mario , a legacy Nintendo game that shares similarities to the game Tetris. Previous work has resulted in a similar system for the game Tetris . Provided below is a high-level outline of the steps that were taken to implement Phase I and the planned steps for Phase II. At the completion of the project we had successfully accomplished Phase I and had begun progress towards Phase II, thereby meeting originally proposed goals.